Goals have been on my mind this past week. Goals, and of course cake. But mostly goals. I’ve been working on a paper for my class and it was on short and long-term goals as an educator. I was majorly distracted and a little frustrated. I began to wonder if I maybe have adult ADHD.To deal with my frustration, I baked. And baked some more. Eventually, I finished my paper. In a haphazard manner, it was complete and I felt incomplete. I was left wondering: do I really want to teach? 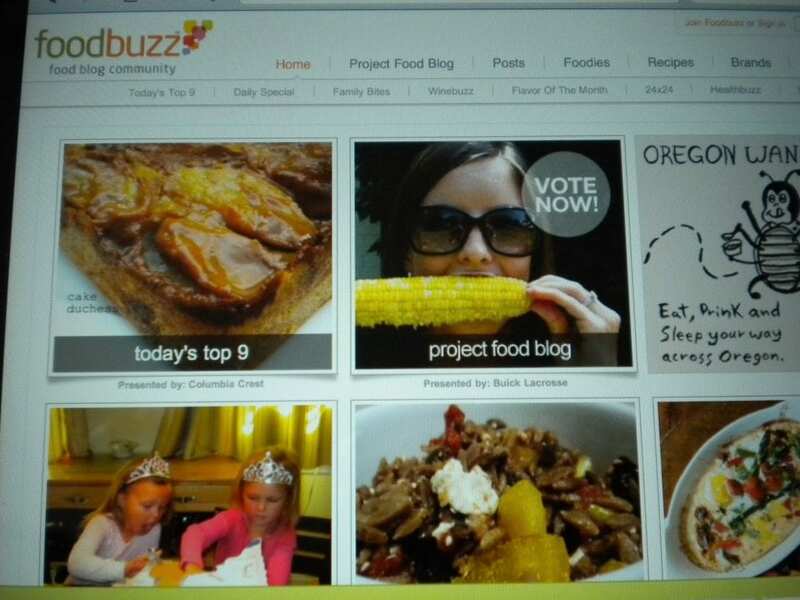 The other day I woke up to see I was number 1 on the top 9 on Foodbuzz on Wednesday for my Upside Down Banana Dulce de Leche Cake. I took a shot of the screen when I saw it. Dorky? A little. But hey, I was excited. 1) I could write a best-selling baking book. It would outsell Ree from The Pioneer Woman and possibly even Paula Deen. 2) I could open the hottest and trendiest bakery in South Florida. People would stand in line for hours like they do for the Cake Boss to sample one of my galettes or cakes. Ensuing bakeries would open all over Italy. 3) The Food Network would discover my talent by some glorious miracle. I would be as popular, or more popular, than Giada de Laurentiis (God, she has the cutest smile!). My cooking line would be in every Target on this continent. I would be a star. A rich star. 4) I could run a famous cooking school in an old castle in Italy. Any part of Italy will do fine. Laura from Ciao Laura will book the tours to visit my incredibly informative and witty classes. We will both be reveling in this sweet success. “Lora, wake up! Wake up! !” OMG! This is so embarassing. I just fell asleep and had the most amazing dream that I was a rich and famous food blogger/cookbook writer/FoodTV star/bakery owner. More famous than Ree Drummond, Paula Deen, and Giada! I was getting ready for my book signing and picking out what shoes to wear. Yes, I am a geek. Back to humble me. 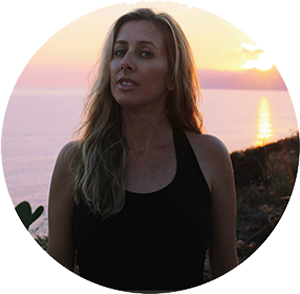 My reality is I am still just blogging on my little blog for you, my dear readers. And for now, it’s all I want to do. 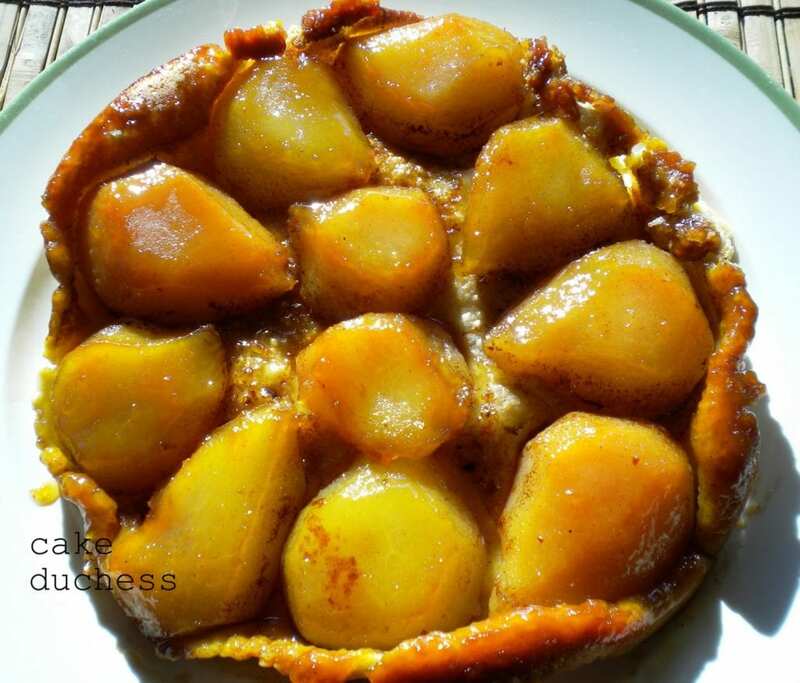 I leave you with a Pear Tarte Tatin recipe to enjoy. If read this, you like it, and even attempt to make it, that will bring me abundant joy and immeasurable satisfaction. This is why I do this. Let’s talk about the Pear Tarte Tatin. I love to make crusts. This crust recipe is simple and to me, crust perfection. It still was flakey and with the perfect firmness the next day. My husband said he hadn’t had a Tarte Tatin like this since he was working in this castle in Italy and there was a French Pastry Chef that used to make them. Now that was a compliment. The pears have to be Bosc. They were made to be the co-star of a tarte tatin. They hold their shape. Don’t use them over ripe. 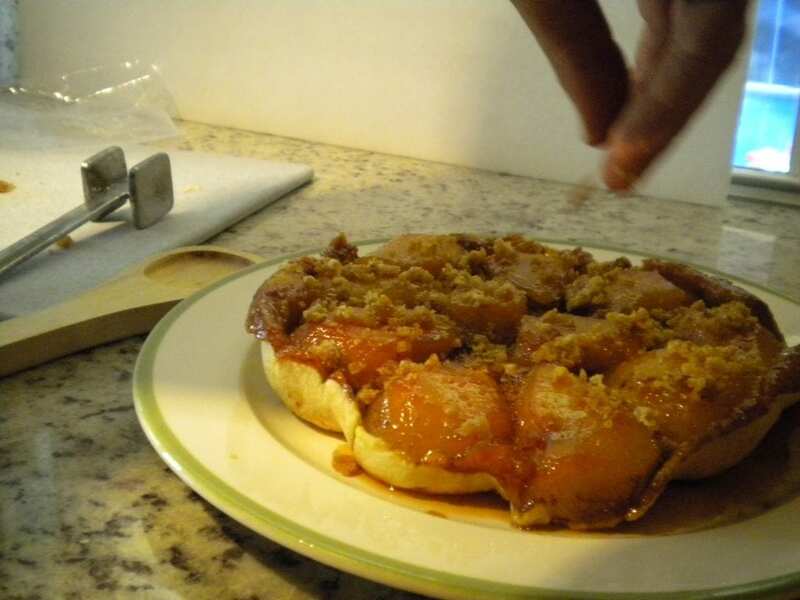 Mushy pears are not easy to peel and clean and will fall apart while making the caramel. A little ugly, but could still taste good. *When you make the caramel, it is ready when it turns amber color. I made this a few times recently. On a recent time, I had to take care of a kid emergency (put Dora on TV!). There were some hard pieces of caramel. It gave me an idea. Keep those delicious toffee pieces and save for when the tarte is done. Smash them up and sprinkle on top. 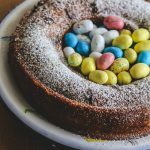 Ingenious and very delicious! When you are ready to roll out, roll it out to about a 1/8-1/4 thickness and it should be about 11 inches in diameter for a 10 inch skillet. 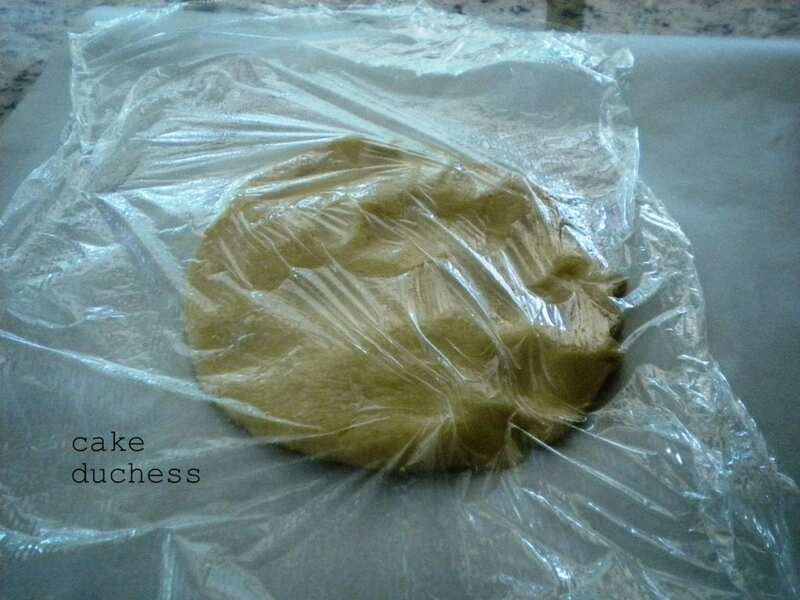 I like to roll the dough out either between two pieces of plastic wrap or parchment paper. 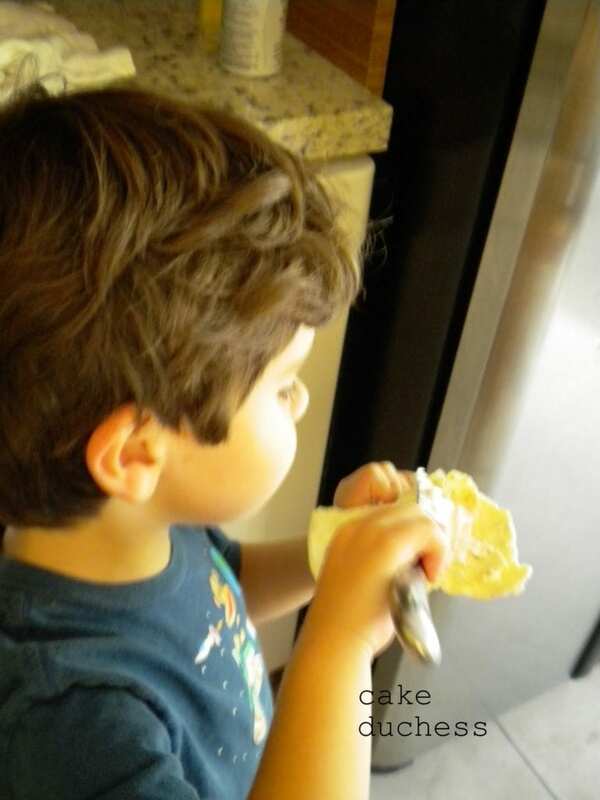 You can leave the dough in the refrigerator until you are ready to use it. Cut the pears in half. Core the pears and take off the stems. Add to the bowl with 1/4 cup of sugar and lemon juice. Let it sit aside for about 20 minutes. Meanwhile, melt the butter in a 9″ ovenproof skillet. I used my ancient cast-iron one. Add the 1 cup of remaining sugar and cook, stirring constantly, over medium heat. It will turn golden brown and start to caramelize. As soon as it changes color, remove from the heat. Drain the pairs and arrange the pears over the caramel mixture. Cut side down and the stem end should go towards the center. 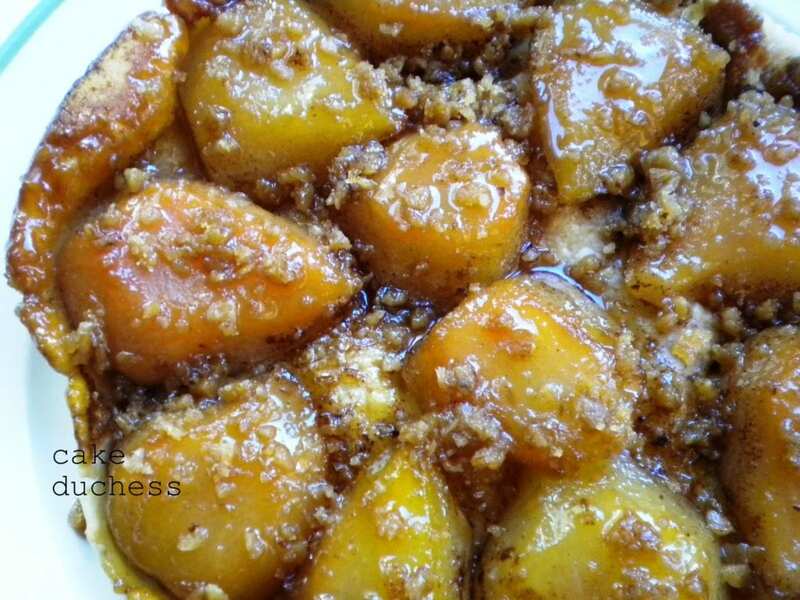 Sprinkle the cinnamon and ginger over the pears. 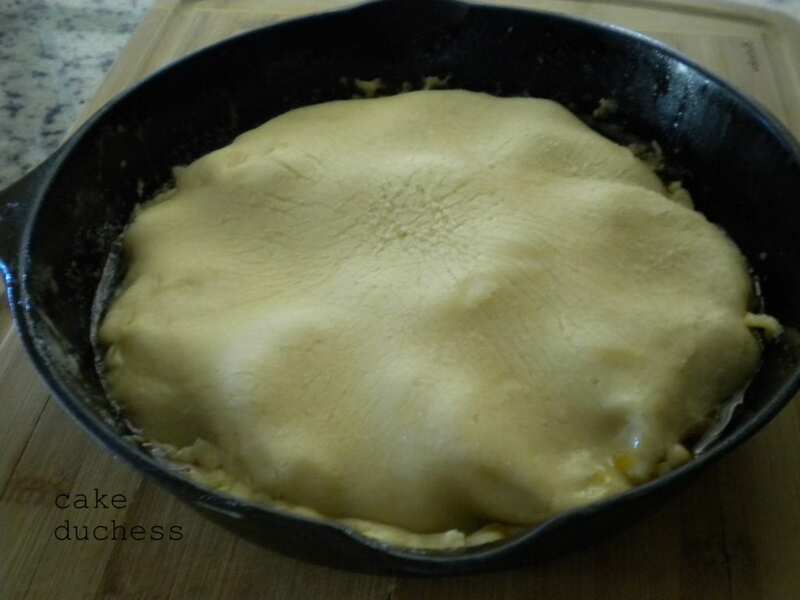 Run a knife along the edges of the cast iron to make sure that none of the puff pastry edges are sticking to the pan. Next, place a large plate or serving platter on top of the cast iron and, using two giant pot holders, invert quickly and carefully because the skillet weighs a ton and is burning hot. You will feel the skillet become lighter and know that it has inverted correctly. Life the cast iron and don’t worry if any of the pears moved around or if some stuck to the pan. You could carefully remove them if they stuck to pan and reassemble. If they moved when you flipped the skillet, just simply place them the way they were before in the tarte. One time when I made the caramel, it was too liquidy. That could happen. If you feel there is too much liquid when you are making your caramel, you could pour some of it carefully into the sink before you add the skillet to the oven. Serve warm. It is even amazing at room temperature. Enjoy your beautiful tarte tatin. Here is the dough ready to put in fridge. 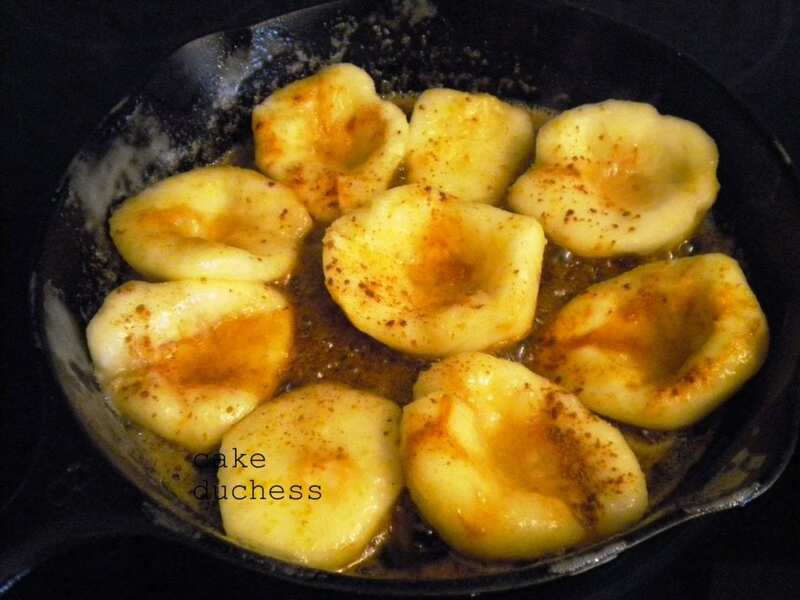 Here are the pears caramelizing with some ginger and cinnamon sprinkled on them. I’m telling you, this smells crazy good! When they are ready, this is how the dough should look on top. I added the four scores with a think knife right in middle (forgot to take a photo of it!). Here is that toffee thing I told you about! I used a meat tenderizer and smashed them up. Toffee will fly every where. It is really good. Save some for the tarte. Sprinkle some on the tarte. 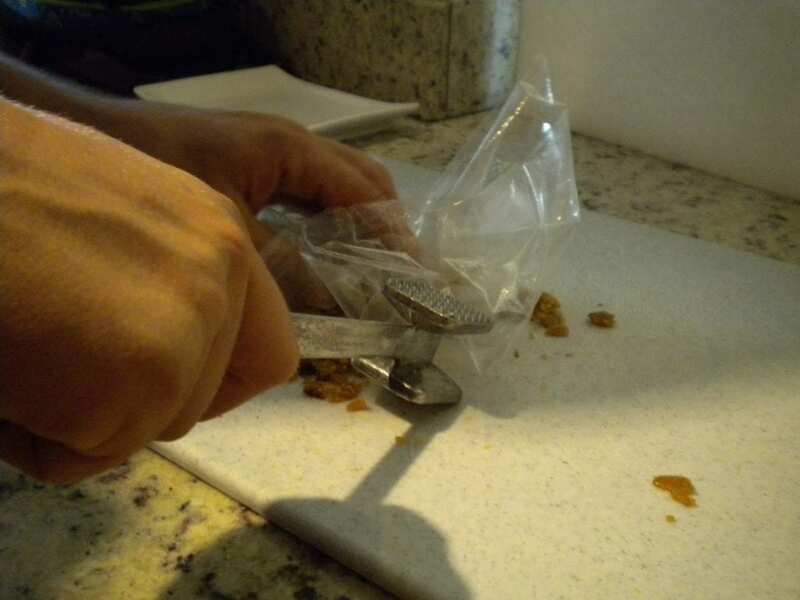 If your caramel doesn’t form any crunchy pieces, you could use toffee bars if you like. This only happened once in the last few times I’ve made this. I may use the toffee bar idea next time. Those are really good too!! This tarte is just gorgeous. It reminds me of a cool, crisp day in France or Italy. Or even North Carolina. A cup of caffe’ latte. Steaming hot. Maybe a dollop of creme fraiche on top. Random photo from other day of my lil’ guy telling me he could put the yogurt on the flat bread by himself because, “I’m a chef mommy.” He was so proud when he said it too. And in case you want to see what I look like and my profile picture is a little boring. 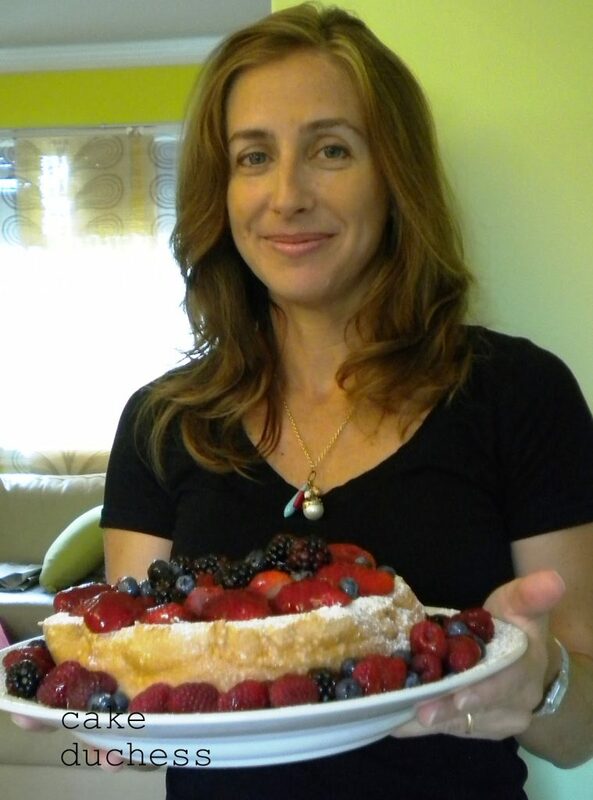 Here is me with a cake on my past birthday. As Mariskaneni (my Hungarian great-aunt would say for a pose), “This is how I look.” Not ever, “How do I look?” Lol! You look wonderful Lora as does you pear tatin and all th egreat baking you do.Love the snippets of your son and always always love grandma's sayings!! Good job!! I'm loving the dream sequence 🙂 The pear tatin looks absolutely gorgeous, and thanks for the tip about crumbling up the hard bits! 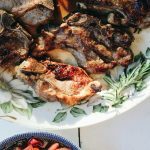 I will be giving this recipe a try very very soon! Thanks so much for the comments! I adore your rustic approach to baking. Food tastes so much better when its not over-fussed. congrats on the Top 9! i've also saved screen shots when i made it. 😉 great looking tatin, too! Congrats on the Top 9! Well deserved. 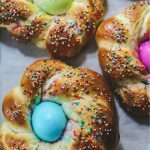 No estaria mal ganar dinero haciendo el blog?? ?Me quedo contodas las opciones, pero cuando los niños crezcan, jejej. Nunca he hecho una tarta tatin, pero tiene un aspecto fabuloso. Por cierto enhorabuena por el el puesto 9…. This is a beautiful tart. I like the pears left in half like that…I usually see them sliced. Really makes a nice presentation. And congrats on the Top 9! Wow I just looked through the first page of your blog and I already have two new recipes that I want to try! 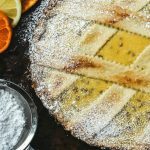 This pear tart looks so good and I loved the galette. The squash potato gnocchi is also on my list. I usually make ricotta gnocchi but I'd to try your recipe this fall. This looks so amazing….great work!!! I say go for all of those ideas!! I'd buy your book and go to your cafe. Glad I'm not the only one with adult adhd! Thanks for the giggle, I do hope I get to buy your cookbook one day, that is one gorgeous pear tarte tatin. I hope to make it one day soon! This is how I look! Wonderful! And even prettier with pastry in your arms! And that is one fabulous tarte tatin! My husband loves desserts like this and he so loves pears.I'll bring him to your castle or your bakery for one! You are going to have to give me a lesson in making crusts! And I was so proud when I saw you on the Top 9! Woo hoo! That tatin looks so beautifully golden. Great idea to add a touch of toffee. I just bought a batch of pears so I think I'll have to give the recipe a try. Many thanks for sharing it and for the gorgeous photos.